Roald Amundsen arrived in the general vicinity of Pole on the afternoon of 14 December 1911, traveling from grid south (he was using the local time of Framheim, which would have been approximately GMT-11; some accounts, including Amundsen's original field notes, use time on the west side of the Date Line which Scott was using, this would make the date 15 December). 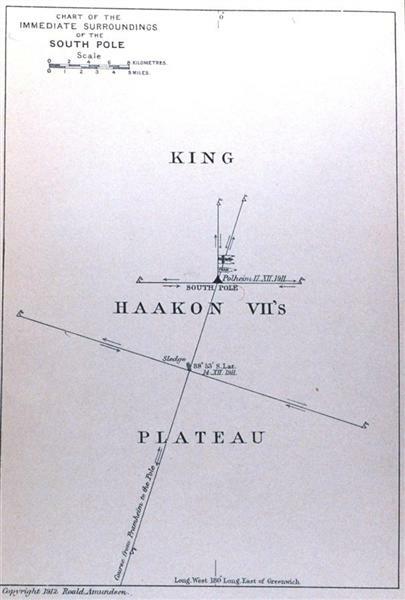 When their sledge meters indicated they should be at the right place, they stopped at the location marked "Sledge" on the map at right (from The South Pole) to determine their position more accurately from sun shots. Amundsen then sent three men out on sledges at 90° intervals. Each went about 10 statute miles; in this way he assured that his party had encircled the Pole. They also left flags at the end of each leg, annotated so that Scott would be able to locate the Pole site. Scott's party did find and sketch one of these flags (above left is the one marked "Flag 2" on the diagram below). 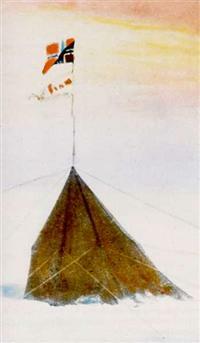 Meanwhile, Amundsen had determined from the sun shots that the Pole lay about 6 miles away, so on the morning of the 16th they they moved to the location marked "Polheim" which is where the famous tent (below left) was erected. On this trip expert skier Olav Bjaaland led the way so that he would be the first to arrive (more about the tent). At Polheim the team took a series of hourly observations for a 24-hour period to confirm their location. What is of interest here is that Amundsen describes his "four navigators" as being Helmer Hanssen, Oscar Wisting, Sverre Hassel and himself--everyone BUT Bjaaland. 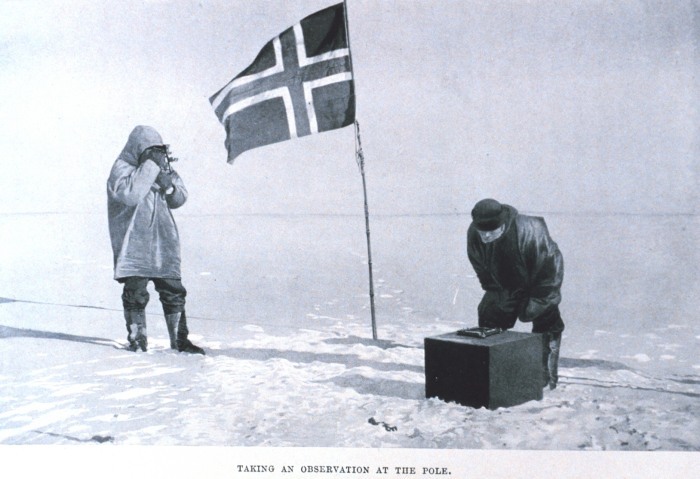 Using Amundsen's diary, Roland Huntford (in The Amundsen Photographs) describes the photo as "Shooting the sun at the South Geographical Pole. Amundsen (left in the top photo) is holding a sextant. Helmer Hanssen (right) is bending over the artificial horizon, which is a tray of mercury. Amundsen is lining up the direct image of the sun with its reflection in the surface of the mercury." Neither Amundsen nor Huntford identify the precise location of the "taking an observation" photo. But Amundsen describes the observation point at Polheim as being a solid snow pedestal, while the depicted platform appears to be a crate. So the photo was perhaps taken at the initial stopping point. In any case Amundsen considered the entire area as "the Pole," while at the same time he made certain he had gotten as close as possible using the available technology. To that end, Bjaaland and Hanssen went about 4-1/2 miles north along the newly identified meridian. Amundsen's published map seen above is actually an idealized fantasy drawn up by Tho. Nilsen, First Officer of the Fram, after the polar party had returned to the ship. When Amundsen got back to Norway, he submitted his data and calculations to an astronomer for review; the original analysis and another diagram are included as an appendix to Amundsen's book The South Pole. 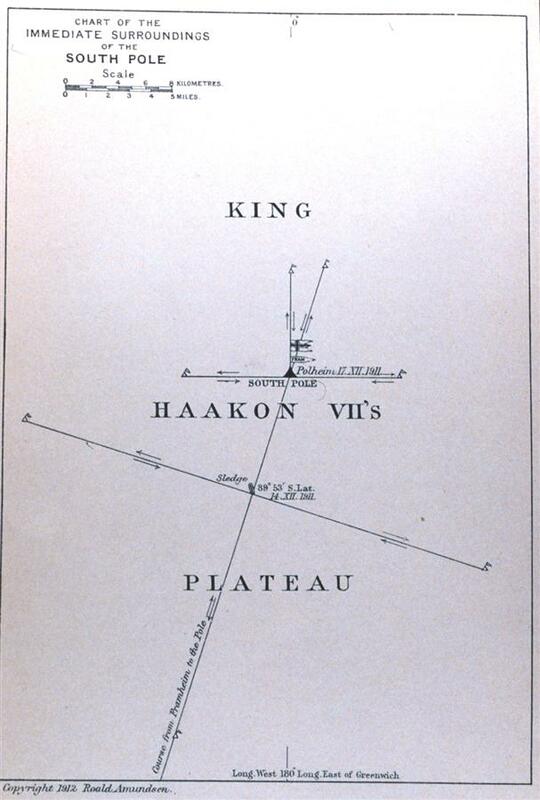 Later, Amundsen's calculations (along with Scott's) were further analyzed by Arthur Hinks, the British geographer and surveyor. In 1944, Hinks published his analysis in The Geographical Journal (of the Royal Geographical Society) in a paper titled "The Observations of Amundsen and Scott at the South Pole". 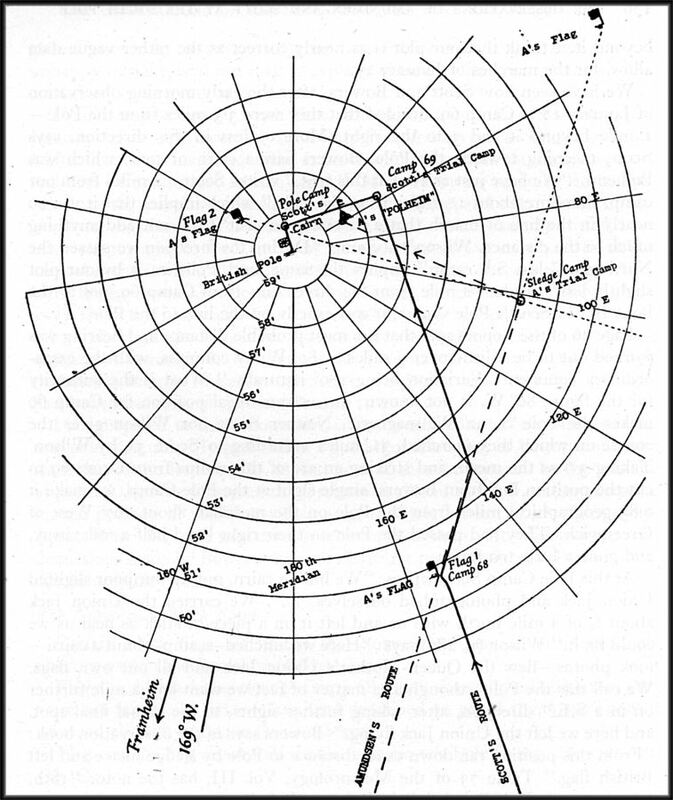 That paper included a composite diagram (at left) of the Pole positions reached by Amundsen and Scott. 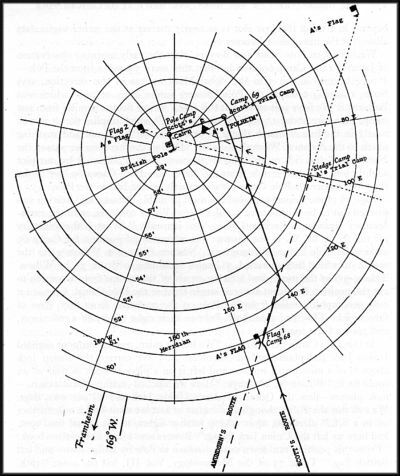 (In 1910, Hinks had conducted a seminar on polar navigation; the simplified techniques he presented were used by Amundsen but not Scott.) As you see, the resulting chart looks quite a bit different from Amundsen's, and it would appear that both Amundsen and Scott got within a mile or two of the actual Pole. So who really is depicted in the above photo? No one is left alive who can resolve the question. It is known that the camera was Bjaaland's snapshot camera. Amundsen had a more elaborate camera, but it was damaged and his photographs were lost. The 1961 notes about the "Taking an Observation" photo given to South Pole Station were almost certainly those left with (or on the back of) the photo by Olav Bjaaland and used by the unknown Navy correspondent who wrote up the original article (see the first reference at the bottom of this page). In any case, the gift of the photo to the station was a magnificent gesture! Regarding Amundsen's photo and map: they are from The South Pole, 1912, by Roald Amundsen, Vol. II, p. 112 (photo) and p. 121 (map). The images used are from the NOAA photo library, where large-scale images are available (the photograph and the map). The sketch of the flag is by Dr. Edward A. Wilson. It was originally published in Scott's Last Expedition, VOL. I. BEING THE JOURNALS OF CAPTAIN R. F. SCOTT, R.N., C.V.O., arranged by Leonard Huxley, 1913. 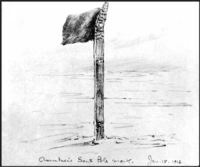 The sketch and the composite diagram were found in "The Observations of Amundsen and Scott at the South Pole," by Arthur R. Hinks, in The Geographical Journal (journal of the Royal Geographical Society, London), Vol. CIII, No. 4, April 1944. The tent photo is discussed and credited here. Scott and Amundsen, 1979, by Roland Huntford. The Amundsen Photographs, 1987, edited by Roland Huntford. Antarctica, My Destiny, 1979, by Finn Ronne. By the way, Roald Amundsen's book is available for free download, in either text or various other formats, from Project Gutenberg. There are many additional images from the book in this section of the NOAA photo library. Scott's diary is available as well, as part of this book. A copy of the photograph at the top of this page was given to the station in 1961 by photographer Olav Bjaaland as part of the recognition of the 50th anniversary of Amundsen's and Scott's arrival at Pole; here is more information about that photograph and about the ceremony. Searches for buried old stations at Pole can be hazardous. At least one serious venture in recent years resulted in a tragic death, as documented by USA Today and the Antarctic Journal..